We partnered with Delta to create a giant tablet that taught its customers all about its digital platforms. Delta was one of the first airlines to embrace digital as part of everyday travel. To promote their new products and services, they wanted to create a giant, interactive tablet that could be deployed at conventions, gatherings, stadiums, etc. — and they wanted it done fast. They needed a partner hands-on enough to make a physical kiosk that would engage, but savvy enough to make an intuitive digital interface that would educate and amuse. That’s where we came in. Since we had all the right skills in-house, Delta knew we’d get the job done right — and on time. 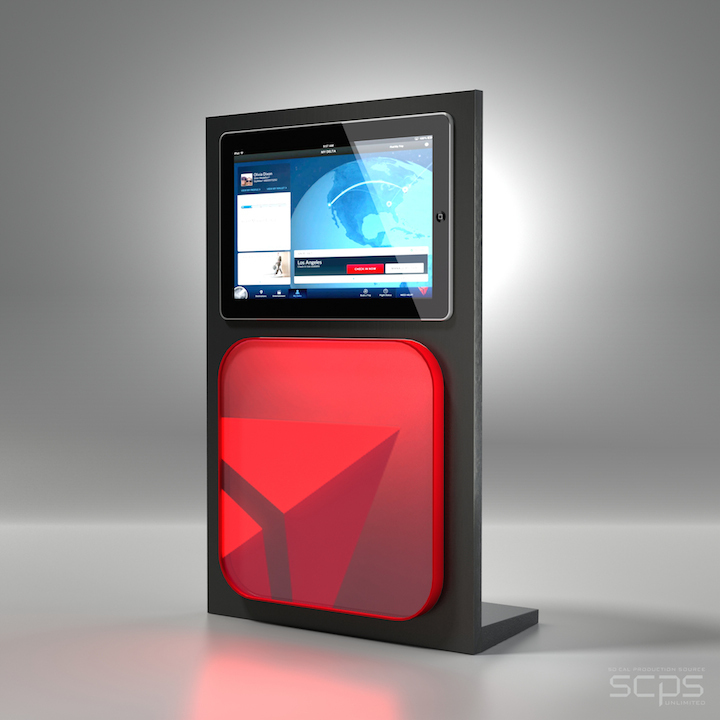 This giant tablet kiosk was a natural next step for an airline that’s always taken a progressive approach to digital. Our diverse crew quickly concepted and created a fully self-sufficient touchscreen monitor, capable of running up to 10 hours off a battery and equipped with WiFi and 4G capabilities so it could be updated remotely at any time. We also designed, modeled and fabricated a sleek console to house the monitor — and it was portable so it could travel the globe without any trouble. Once they saw how awesome our first prototype was, Delta wanted to add features and create more units — and luckily, we built it in a scalable way so modules were easy to add. With its carousel-based interface and simple design, our tablet now teaches customers about the Delta iPad and iPhone apps, their website and more. It’s a tool they’ve used again and again — and a project we’re super proud of.